Super-speedy Sonic gets ready to take off on this eye-catching Sonic the Hedgehog t shirt in youth sizes! 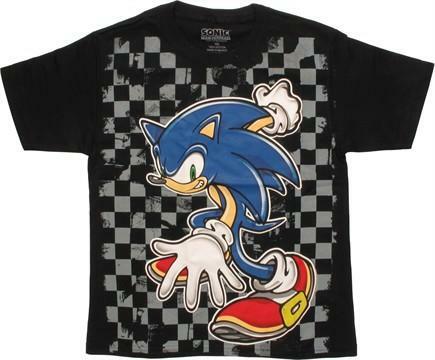 The Sonic the Hedgehog Checker Board Youth T-Shirt is black. The front is covered by a very large portrait of Sonic from the videogame series Sonic the Hedgehog, framed by a black-and-gray checkerboard pattern with a beat-up look!